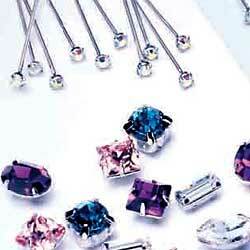 Crystallized™ - Swarovski Elements Single Stone Settings are findings with Round or Fancy Stones set into metal cups. They are available in many different ring combinations with varying back configurations. All these can come in a multitude of shapes and sizes. DIY findings are also a part of this product range. We will collect a list of product items here for you for your easy reference. They will be sorted by their Codes. Not every stone setting has a name but when they do, we will include it. Click on the code-link for more details of each stone setting.